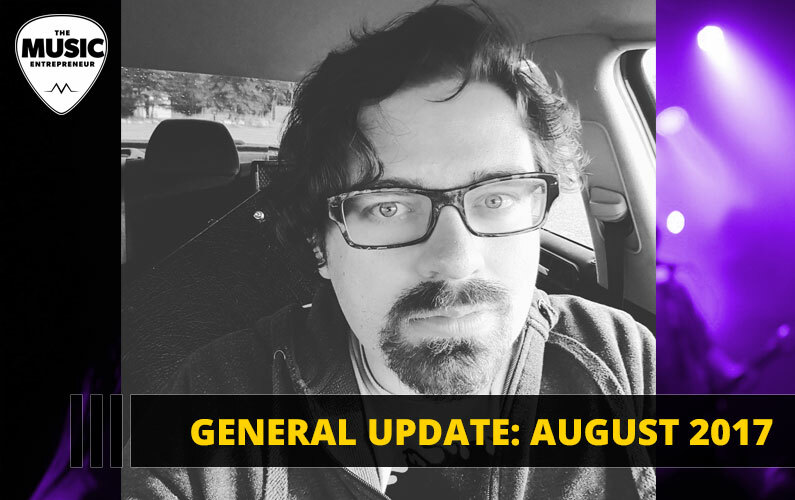 It’s been a while since I’ve done any kind of personal- or career-based update. But I feel like some of the changes I’ve been making to my work life warrant a proper announcement. In this episode of The New Music Industry Podcast, I share what I’ve been up to this summer, some of the changes that have been occurring in my life, as well as what I’m planning to do moving forward. 07:52 – What are your thoughts on everything I’ve shared with you? Thanks for joining me. Today, I wanted to share an update with you. I don’t think I’ve done a general update like this one before since starting The New Music Industry Podcast, but there is a good reason why I’ve put together this episode. So first I want to share a little bit about what I’ve been up to. Obviously, one of the things I’ve been working on is the new book Flashes of Elation. I am in the editing phase and I’ll be passing that manuscript off to editors very soon. That process has been going relatively smoothly, although I admit I haven’t been working on it as much as I feel I should be. The reason for that is because I’ve been feeling a little bit burnt out. This is something that came to the forefront at the end of June. I was actually out of town for two weeks conducting my business and work outside of Calgary. So that was all well and good, but life circumstances began to change fairly quickly after I returned home. I’m not going to bore you with all the details, because I feel like we might get into a little bit of woo-woo territory which I’m not sure all of you would necessarily relate to, but from a practical standpoint I’ve really been going at it hard for the last three years. I needed to get my finances under control. It was worth doing, but on the other end of it I find myself a little bit tired and even restless. I’ve been taking some time to enjoy the summer because it really is one of my favorite seasons. I’ve been going out of town to places like Red Deer, and Canmore, and Airdrie, and pretty much just wherever I could get myself to. I’ve been spending some time with friends and enjoying a little bit more of a meaningful social life than before. I think that’s something I do want to incorporate more moving forward. It’s become really important to me. I’ve been walking, and working out, and doing hot yoga, and exercising a lot more than before. Paying attention to my health. And health is one of my theme words for the year. I always set three theme words. Health ended up being one of them. It really has guided some of my decisions this year. I think that’s been for the best. You’ve noticed that I have kept up with the podcast in spite of everything that’s been happening. I think I will continue to keep up with it. I have no plans of changing my regular publishing schedule, but some things have fallen by the wayside including The Music Entrepreneur Live event I was planning for August. In addition to being burnt out, I’ve actually been sick basically twice this summer, so I had to spend time recovering from that also. I feel a lot healthier now. I think I’ve just been a little bit more immunocompromised due to working out a lot more. As well as maybe some of the smoke that we’ve been seeing here in Calgary due to the forest fires in BC. It’s still possible that I will reschedule The Music Entrepreneur Live for another date, or I might even attempt to do maybe smaller get together instead of trying to hold one big event and plan the whole thing. Because if I’m doing it all alone, obviously it’s a lot of work. That’s something I’ll talk more about in a minute, but I think I’ve been a little bit overcommitted in trying to do too many things. What’s the plan moving forward? Well, you may be aware of my other podcast, Using Your Power, and my co-host Maveen. Him and I talk regularly. We’re essentially business partners at this point. We’ve been talking a lot about the future and what we intend to do and what we hope to accomplish in our respective endeavors. I think we both agree we’ve been trying to do way too much and we’ve been torn in a bunch of different directions. But talking to him has really helped me boil things down into what I feel are the essentials for continuing with The Music Entrepreneur HQ. So, here’s what I’m thinking. First of all, I think I will still continue to publish one podcast episode per week, so nothing will change there. If you’ve already subscribed, then you’re getting these episodes on a weekly basis. There’s a lot of you sending me guest posts, so I’m still going to do my best to sort through those and publish the ones that are suitable to the site. One thing I probably won’t be doing for a while is the weekly digest. This is a great piece of content. I think it is valuable, but since I’ll be publishing a lot less, there isn’t as much of a reason to put that out weekly. Based on some of the discussions I’ve had with Maveen, I’ve put together a basic five-item plan for what I’m looking to do moving forward for The Music Entrepreneur, and what I really feel are the most essential items needed to continue to grow this business. In addition to that, I wanted to streamline what I do here at the Music Entrepreneur HQ, so I could more fully commit to and embrace my clients and the projects I’m involved in. When I’m running around like a headless chicken trying to do so many different things, unfortunately my attention isn’t fully on some of the projects that I’m involved with. Really I’ve just been trying to do too many things. I’ve been making videos, recording podcast episodes, writing blog posts, creating different types of products and resources, and all of that is great, especially if you can sustain it, but it seems like I never seem to get around to it all even though I try. Even if I do get around to it, sometimes it’s months or even years before it’s all done. By that point I have new things in the works. So that’s why I decided to narrow things down to a basic five-item plan, which includes traffic strategies as well as the ways that I connect with you and the products that I create. As far as products are concerned, moving forward I want to focus on writing books. One of the reasons for this is because it is very fulfilling to me. I think writing is something that I want to continue to do and pursue as a passion. Now, some of you have told me that a book isn’t necessarily what you want and that is totally fine. I understand where you’re coming from, because you might be looking for other things like video courses or coaching – some of the things that I have offered in the past. But to me – and I’m not sure if you would agree – but books are absolutely invaluable. It lays out the way a person thinks, as well as the systems they used to get the results they were able to obtain. So really you get an inside look into how people operate, which to me is incredible. Some of you also told me good content is not hard to find, which I understand and generally agree with, but to obtain the same knowledge I share in a book, you would probably have to live a whole other lifetime or spend years researching and curating it yourself. So really you have to ask yourself, is it worth the $15, $20 price tag I’m asking for to obtain years and years and years of research and knowledge or not? To me the answer is pretty obvious, but if you don’t feel the same way, that’s okay, I understand. Hopefully, I can find some time and energy to help you in the ways that you need down the line. Ultimately, this doesn’t mean I won’t be creating different kinds of resources or offering other services in the future, but for the time being, I feel I should focus on delivering on the promises I’ve already made, which includes the book Flashes of Elation, as well as some of the other communities and projects that I am committed to right now. I hope you can see where I am coming from on this, but your feedback is still incredibly valuable to me. What are your thoughts on what I’ve shared with you today? Is one podcast episode per week enough content to keep you engaged, or should I be publishing more often as I have been up to this point? What are your thoughts on books? Would you buy one if it addresses the topic of your interest? If so, what is that topic of interest? You can comment in the show notes or send me an email to david@dawcast.com. d-a-w-c-a-s-t.com and let me know your thoughts.